There was a time in 2007 where I made a game with a bunch of ladies (plus one guy who helped out!) called Rojak Institute. 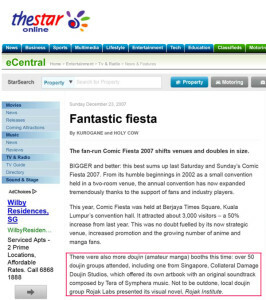 We premiered it at Cosfest (Singapore) and Comic Fiesta (Malaysia) in 2007 but we made the game in the one year before that. Or technically less than a year. 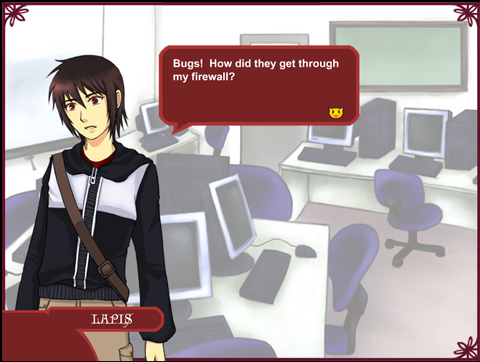 So it started around in mid 2006 that Kei grabbed a bunch of us writers, illustrators and programmers to do a visual novel game. Mind you, we were either working/interning/schooling. Mostly in school. Rojak Institute had original art, story and heck MUSIC. It is originally made in flash and was sold at our conventions in CD-Rs with printed bookmarks so it auto ran when you placed it in your computer. To start, since this is a download, click opening.exe. If you’re on a Mac, click opening.swf. You have to remember this was 2007. No one else made a game just for Cosfest or Comic Fiesta. Everyone else were selling art prints or fandom doujinshis and we were there selling originals. The only bugs that we had in the game were these. Hahah literal in game bugs. 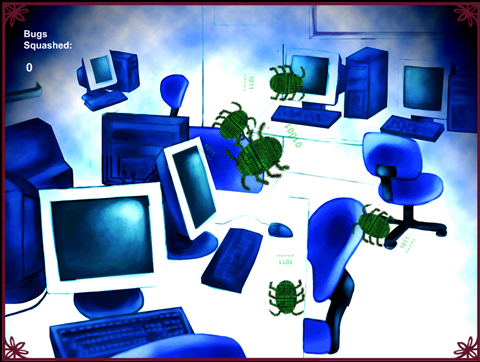 If you couldn’t click the bugs, you just had to put your mouse and hover over where the bugs would go. They kinda go in a linear route so just wait and click. 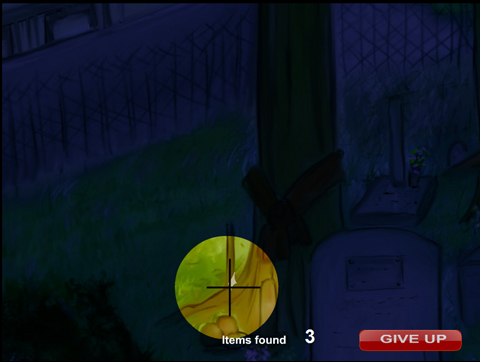 To note though, our game had no SAVE points so you have to play through the whole game. It’s a short run through though and that there are multiple endings. We had a lack of options such as triggering the music on and off but pretty much, that was it. 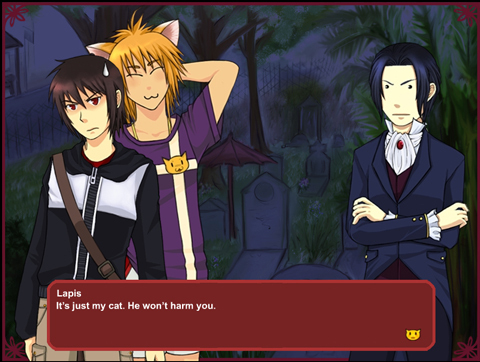 Ours was very story based since it was indeed a visual novel game. Like those Japanese ones only this time it was in English. There were a LACK of English visual novel games back then so this was super unique. The story? 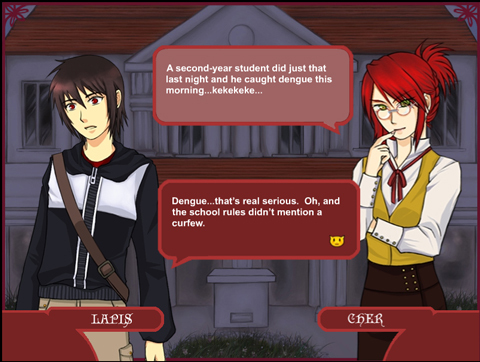 Lapis is a new transfer student to Rojak Institute and adventure happens. There’s some Singapore mythology going on there too and if you know a bit of Singlish, there are some puns involved. Kei and I wrote the script so heh, yes we had reviews on how it was very amusing. The process of making the game was such that we didn’t meet each other at all. Everyone had their own schedules and we just sent stuff via email and uploaded files through Kei’s server. It was one of the best group work projects ever as we all went AHHHH trying to complete this. I helped out with the programming because we were lacking time and were gonna debut it at the conventions. Using the artwork that the artists made, changing the expressions according to the script. And since our script had multiple dialogue choices I think it ran around a hundred plus pages? 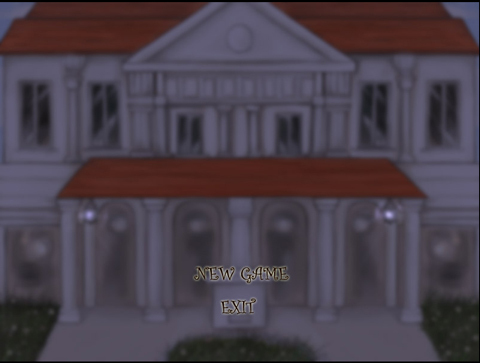 The main programmer did the mini games and… we were on a deadline too since some of us were using trial versions of some software, I can’t remember now but it was like simplified Flash. 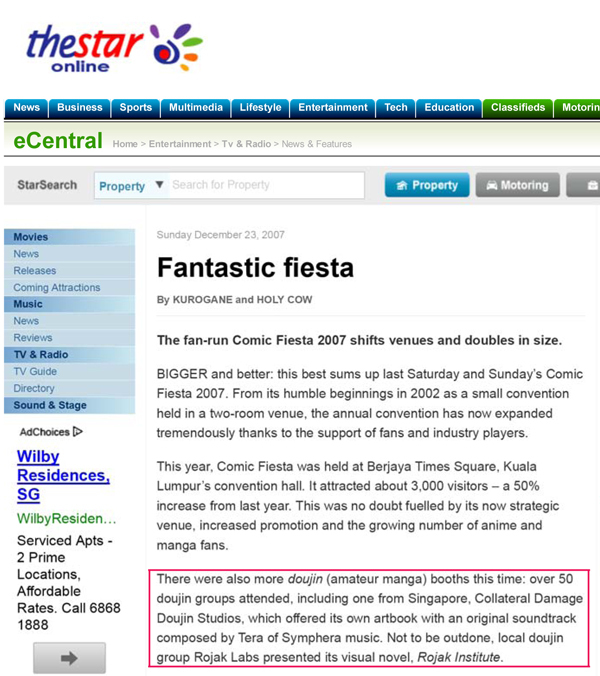 And we did get featured in Malaysia’s The Star that year! And also a mention by Zerohero. I have no idea where he is now or where he is. I missed his otaku/game reviews or to just say hi to him. A memorable thing when selling the game at Cosfest in Singapore was that there were a lot of girls asking if it was BL since there was Lapis and a lot of other students in that game. Unfortunately noooo, it is not a BL game and instead rated G for everyone! And then there was an obnoxious guy who asked, “THIS ONE CAN KILL PEOPLE OR NOT?” we said no and he huffed away. And Kei and I looked at each other like, ok.
Dude, dude not every game has to be violent and that we had freaking huge signs saying that it was a visual novel game and the plot and all that at the booth. That was very annoying cause some of them were EXPECTING shooter games when it was obviously not?? Sheeeeeeeeeesh. So anyway, play the game! It’s now free since it’s been years since we debuted. I’d like to think the whole group improved a lot in our own crafts by now.